Today is another installment of my Watercolor Wednesday series on the Unity blog. Get 40% off using code lovingtoday of the Unity kit I used today called Loving Today. Valid 2-28-18 only. On the Unity blog today, you will find photos, instructions and a video tutorial to show you how this gift tag was made and to easily duplicate the process. This is a way to use stamping with existing dried watercolor. This is a mixed media style gift tag, great for birthday, celebrations or congratulations. I love having these on hand for gift bags or as wine tags. 45% off code lovingtoday for the Unity kit I used today called Loving Today. Valid 2-28-18 only. Share this and tell your friends about today's deal. Supplies: Unity Stamp Co. Loving Today, Brusho Crystal Colors, embossing powder, watercolor paper, sequins and My Creative Time Tag Dies. For all of the details, visit the Unity blog. Hello, it's Gaylynn here with a project for My Creative Time's Inspire Me Wednesday. This handmade card is made using stamps, dies, watercolor and embossing powder. I used watercolor paper with distress markers and a water brush for the flowers and then die-cut each of them. For the background, I splattered black ink. The sentiment was stamped, heat embossed in gold and die-cut. Then, I assembled it all with foam adhesive. I love the free falling look of the flowers. Spring is on my mind and it is the inspiration for this card. Supplies: My Creative Time Just Because, Chunky Jar Accessories Set Revised, Thank You & Frame Dies; Ranger watercolor paper, distress markers, distress reinker and embossing powder. Be sure to see Emma's MCT blog for more Inspire Me Wednesday projects. 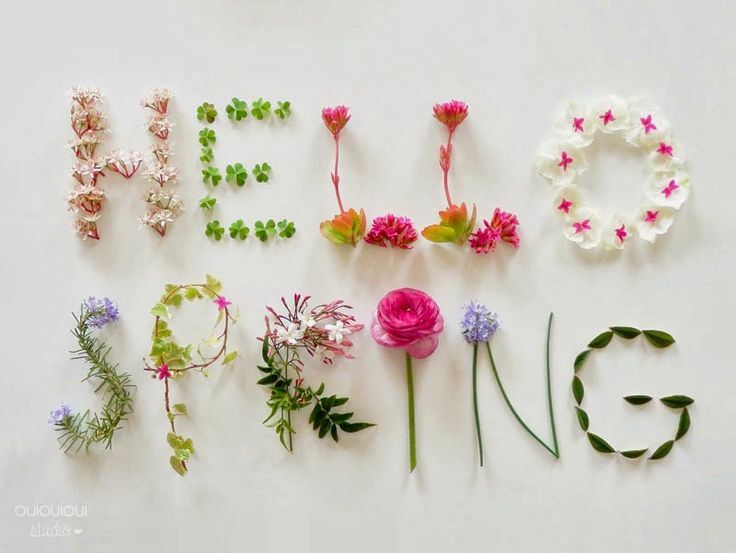 Have a blossomy good day. Poppy flowers jar vase handmade birthday card. 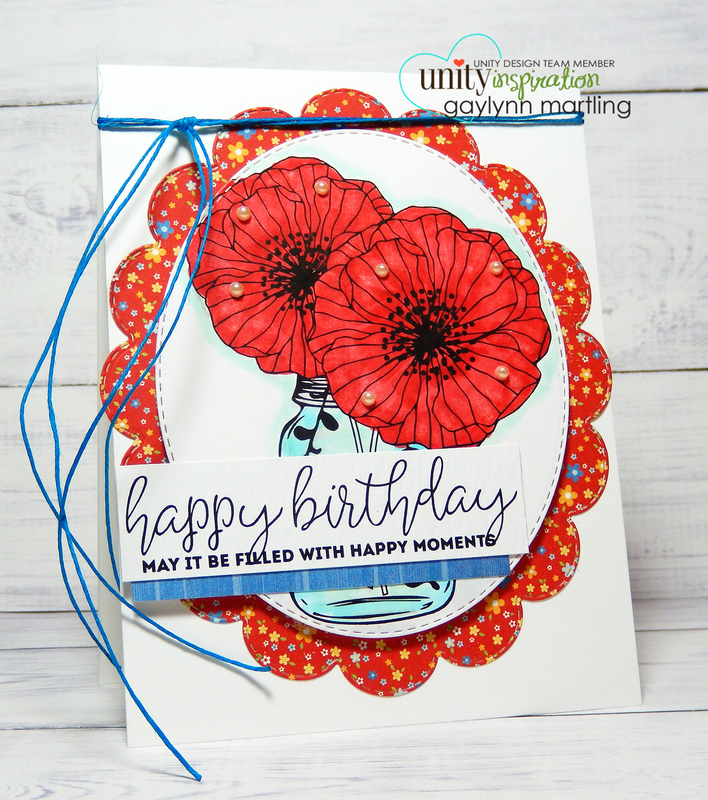 Here is a floral birthday card with red poppy flowers in a jar vase. Sentiment: Happy birthday. May it be filled with happy moments. This one is bright and cheerful. I used Copic markers with the colorless blender for subtle highlights, patterned paper die-cuts and a sentiment trim. Here is a short video tutorial showing this flower jar card process. Scalloped Stitched Oval Dies, BasicGrey paper, Copic markers 0, R27, C1, BG10, B01. Thanks for all the laughs watercolor flower card. Having thank you cards on hand is great, especially when sending a hand crafted card. This one includes a watercolor flower. Sentiment: Thanks for all the laughs and all the good times. This is the kind of card someone won't expect, but offers a pretty surprise. This card was made with stamping and die-cuts. I stamped a lacy background border and then used watercolor for the flower. Everything was layered, sweetly. Here is a video of this thank you card process. I wanted the flower to stand alone, so after the watercolor was dry, I fussy cut it out and placed it on the circle frame. I added leftover pieces for the frame, sentiment tag and the hearts. Supplies: Unity Stamp Co. Friends Like You and Feel & Give Love SMAK, MFT die-namics and ink pad, My Creative Time Curly Label Die and Stitched Sweetheart & XOXO dies, water brush, Ranger watercolor paper, ink and distress markers. I hope you like this sweet card. Have a wonderful day. Stretch your stamps. 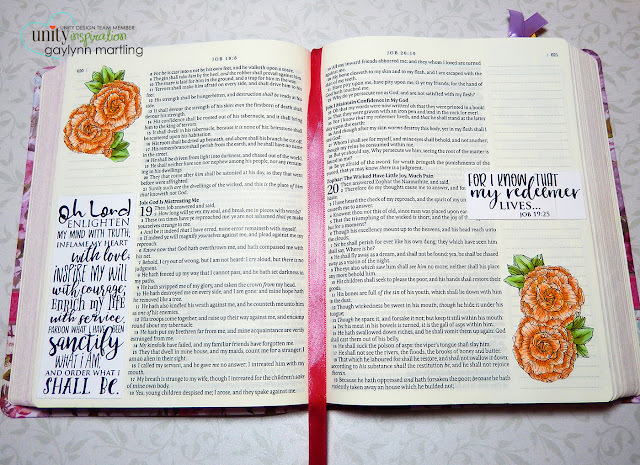 ~ Bible journal flowers. This is more of my bible journaling art, with flowers and scripture. This is a way to incorporate stamping in your journal and use a stamp a little differently at the same time. All of the images and words are stamps from the same Unity kit. Everything was prepared on white cardstock and the flowers were colored with Copic markers. The flower stamps is one long row of pretty flowers. It would fit nicely that way on the page border. But, I wanted to use the beautiful sentiments also. I am showing how to stretch your stamps in a tutorial video for these bible pages. Taking one stamp and using it differently is something I like to do, occasionally. I wanted smaller flower bits on each page, so I fussy cut the flowers to make two smaller clusters. And here is a look at the second page. I have a series of articles on how I decorate my bible pages. I experiment with different ways to incorporate stamping, markers and inks on the thin pages. For more of my articles like this one, visit bible journal. 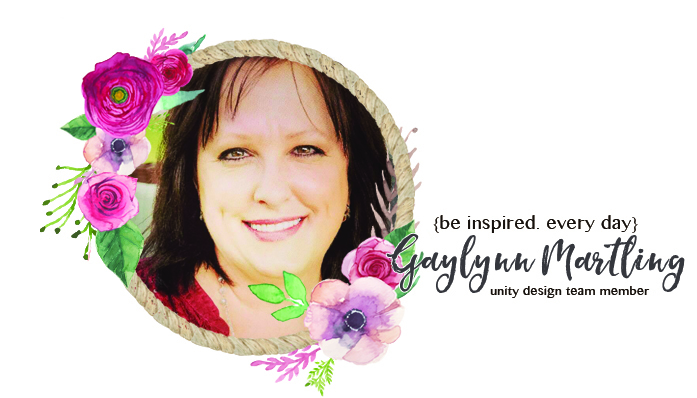 Supplies: Unity Stamp Co. Gardenia Floral Border by Graciellie Design, Copic markers, My Creative Bible. Feel free to share comments or suggestions for other crafty demonstrations. Watercolor with Brusho along with emboss resist techniques. Hello, it's Gaylynn here with a peek at one of the projects featured on the Unity blog today, for my third post in the Watercolor Wednesday series there. Use code wildflowers in the Unity store, valid throughout 2-21-18 only, for 40% off of the kits used in today's Watercolor Wednesday post on the Unity blog. Supplies: Unity Stamp Co. She and Delicate Wildflowers, My Creative Time Scalloped Stitched Rectangular Dies, Brusho Crystal Colors, Ranger mini mister, watercolor paper and embossing powder, My Sweet Petunia Original Misti, Sizzix Big Shot and adhesive pearls. Be sure to visit the Unity blog for all of today's project photos, video tutorial and also written instructions. Coupon Code Alert 2-21-18 only ~ wildflowers ~ Don't forget today's deal noted above. Share the deal with your friends. Tune in next week for another watercolor project. Hello, it's Gaylynn here with the My Creative Time 76th Edition release, blog hop and sale at the MCT store. For the blog hop, you should have arrived from Emily's blog. Your next stop in the hop is Jessica. If you get lost along the way, the entire blog hop lineup is on Emma's My Creative Time blog. 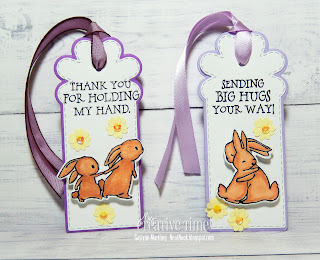 Today, I am sharing a set of Easter gift card holders or treat holders. The big kids like a little candy, but prefer the gift cards or cash. Of course, the packaging has to get dolled up first. For these gift card holders, I made pocket style containers with double-sided paper and the MCT Scallop Stitched Envelope Die. I chose to leave the holder with an open end. I folded the scalloped top piece down towards the front of holder instead of using that part as a closure. A faux closure tab and brad were added as accents. The Cute Stitched Egg Tag Die worked perfectly as the container decoration. There is room on the inside of the egg tag to write a little message. The MCT 76th Edition release and freebie follows. For this week's projects, I used shades of purple. Here are my other projects for this release. Sneak Peek Day 1, Day 2, Day 3. Here is a closer look at my gift card holders. ALSO, DON'T FORGET our sale starts RIGHT NOW in the My Creative Time store. Use the code: FEB2018 to receive a discount off your entire purchase! This sale applies to "IN-STOCK" items ONLY. This sale will end on Friday, FEB 24, 2018 @midnight PST. Remember to hop along with us. Your next stop in the hop is Jessica. Thank you so much for visiting. I look forward to your comments. 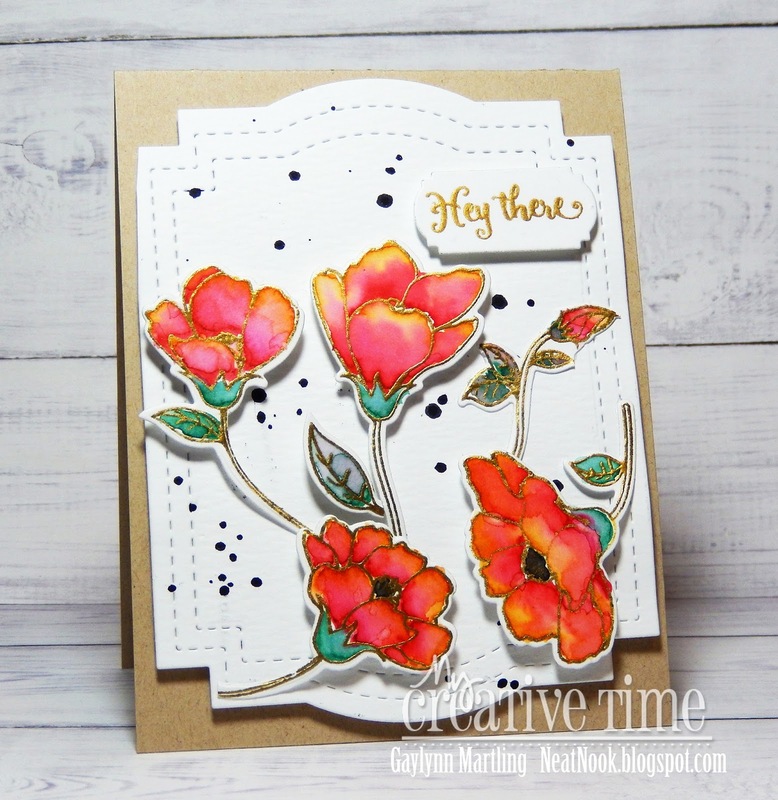 Hello, it's Gaylynn here with my last sneak peek of the upcoming releases at the My Creative Time shop. I'll always be HARE for you. Using the new Chunky Tag Dies, I decided to add a few color layers. I made frames from the tag dies by nesting them together to die-cut. I also die-cut white watercolor paper and clear cardstock to make a shaker. On the white tag background portion, I lightly added watercolor from green to blue to mimic grass and the sky. Next, the sentiment and bunnies were stamped and die-cut. Then I colored the bunnies with watercolor, also. Finally, I assembled the shaker and the card. 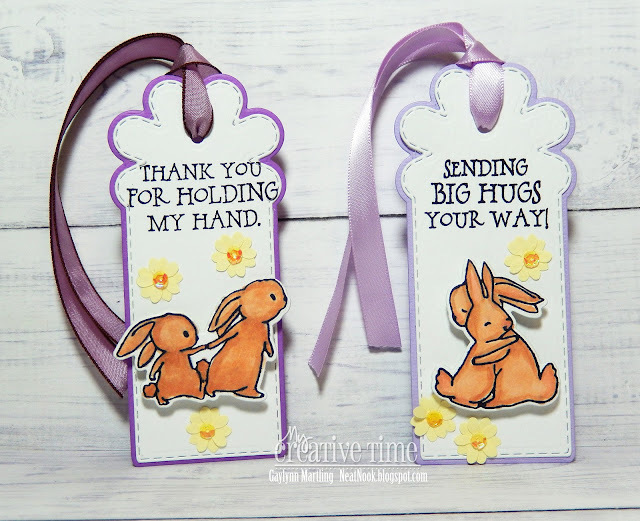 I tell ya, these bunny stamps, dies and sentiments work well with Easter, many other themes and all kinds of different projects. Be sure to comment and then visit Emma's My Creative Time blog for more projects. I will be back tomorrow with the full release reveal. Have a lovely day. Hello and welcome to a sneak peek at my second installment of Watercolor Wednesday, posted on the Unity blog. Today's article focuses on watercolor with Sakura Koi or pan style watercolors along with gold heat embossing. I include a video tutorial and also written instructions for this technique. I love the results that it provides. For all of the details about this watercolor project and more, visit the Unity blog. Today only, I am offering a coupon code happywednesday for 45% off of the Unity kits used here, and the code expires at midnight, 2-14-18. For details about my first watercolor post, see Watercolor with Distress Markers. Wishing you and yours a happy and lovely Valentine's Day. 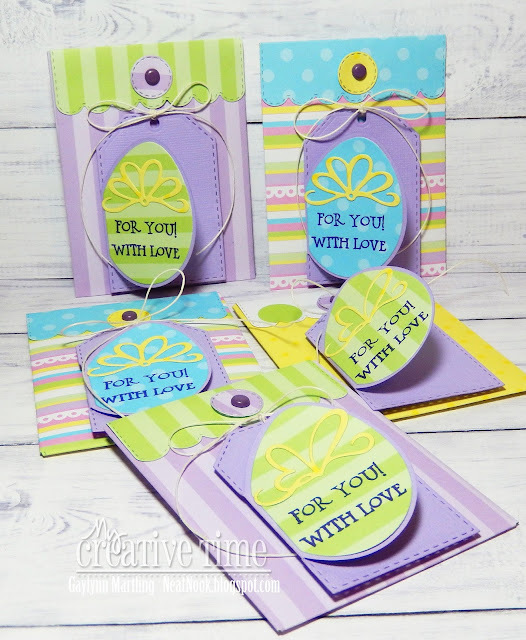 Hello, it's Gaylynn here with another sneak peek at two of the upcoming releases in the My Creative Time store. 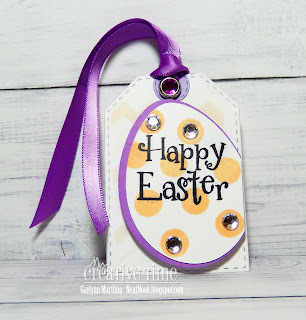 For this gift tag, I used the tag along with the separate egg die pieces. Then, I stamped the egg and the background in polka dots and chevron patterns using the egg decoration stamps. For a little sparkle, I added shiny adhesive rhinestones and a rhinestone brad. I kept this simple because this is one of a few gift tags which I will be using for Easter favor bags. I will be back tomorrow with another sneak peek. Have a lovely day. 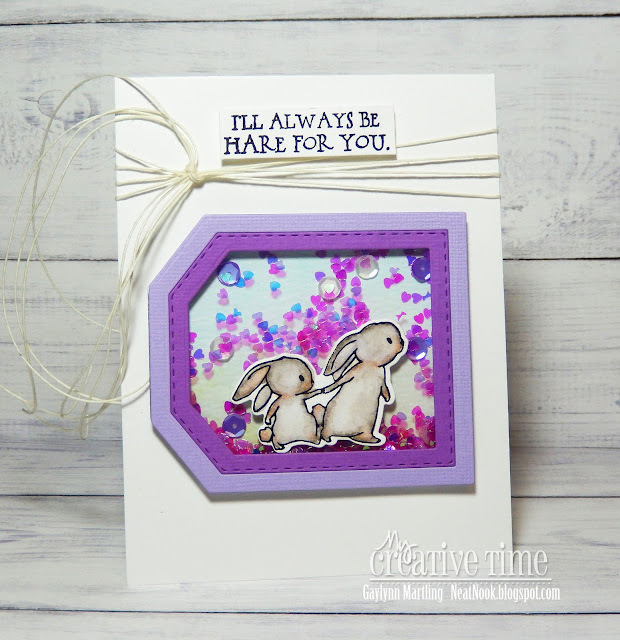 Hello, it's Gaylynn here with a peek at one of the upcoming releases in the My Creative Time store. These are the sweetest bunnies which can be used for Easter time and so many other occasions. The tags can be used for favor bags, gifts, bookmarks or just added to a handmade card. I used Copic markers for these cuties. The tags were die-cut and I added tiny sequin flowers. 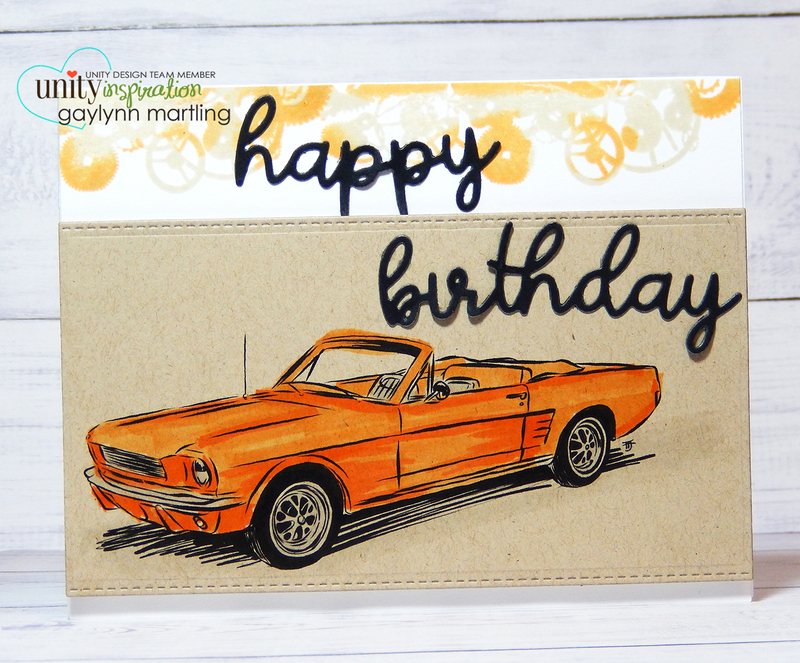 This is a masculine birthday handmade card featuring a classic car, a Ford Mustang. For this card, I colored the car with Copic markers, stamped the gears at the top in two different colors and added a die-cut sentiment. The two toned stamping and the coloring are highlighted in a quick tip video tutorial. I used kraft color cardstock to add to the vintage look of the car. Using the gears along with the mustang, gave it a great masculine look, perfect for the guys. Supplies: Unity Stamp Co. All Cylinders and Go Forward stamps, Copic markers YR14, C1, YR04, PaperTrey, Ink and MFT dies, inks by Ranger and MFT. 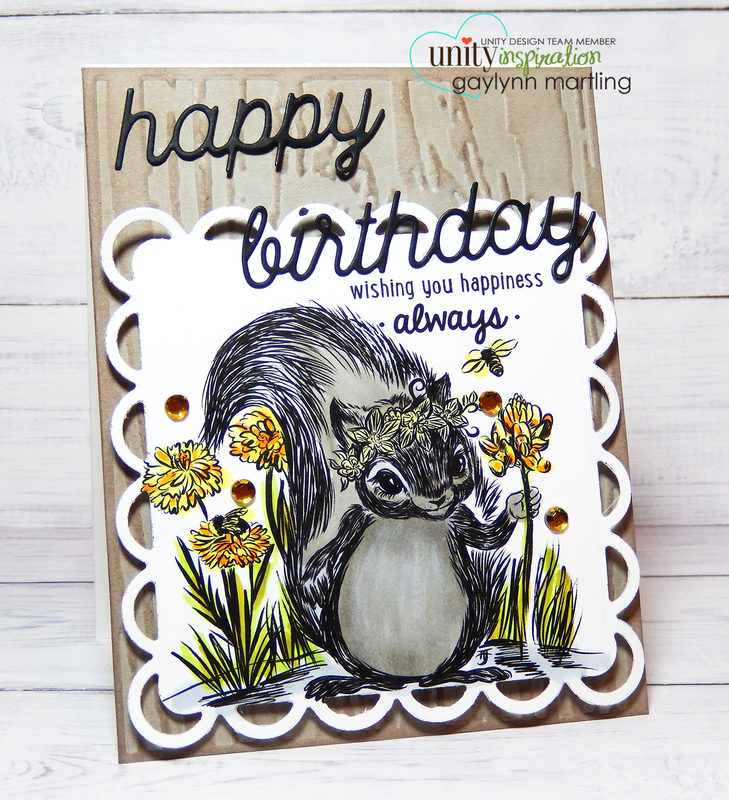 Birthday squirrel for Unity's blog hop, release and sale. Hello, it's Gaylynn here today with squirrel cuteness. This is one of the newest Unity releases and part of the Unity Stamp Co. blog hop and sale, going on now throughout the weekend. Sentiment: Happy birthday. Wishing you happiness always. For this birthday card, I used the Unity kit called Nibbles, by Tierra Jackson. I love the flowers and the garden look. I gave this card a dry embossed wood grain background from gray cardstock, distressed the background to show the grain better and I die-cut lacy edges for the squirrel panel. I also used Copic markers to color the squirrel scene. I made a quick video tutorial for this squirrel card. Supplies: Unity Stamp Co. Nibbles, MFT and Spellbinders dies, Copic markers YG95, YG13, Y13, Y11, C3, C5, W5, YR14; adhesive rhinestones, Tim Holtz Sizzix embossing folder, Big Shot, distress ink pad. 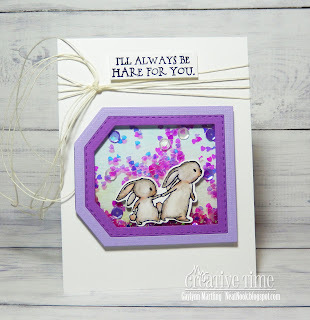 Be sure to hop along with us in the blog hop and then shop Unity. Watercolor with distress markers ~ masculine card. Hello, it's Gaylynn with a project that is up on the Unity blog for my weekly feature called Watercolor Wednesday. I am super excited about this. Be sure to check out their blog each Wednesday for tips and demonstrations in watercolor, primarily for use with stamped projects. Here is my project for today. This one includes two demonstration videos, one for how I made the background and one for the watercolor process. Sentiment: Happy birthday to a classic guy. Making masculine cards can be a little challenging. But with the right stamps and experimenting with different techniques, it can produce neat outcomes, perfect for the guys. I have a watercolor video, written tutorial and tips on the Unity blog. To learn more about this project, visit my Watercolor Wednesday series on the Unity blog for this masculine card. Today only, use the coupon code vintage to get the kits used in this project at 50% off in the Unity shop. I used the Unity kits called Slowly Turning Classic and Vibes. Visit my YouTube channel Gaylynn NeatThingsBtq for creative tutorials. Good morning and welcome to another "48 Hour Flash Sale!" This sale is for 48 hours ONLY that is going on right NOW and will end on Sunday, February 4, 2018 @ 7am PST. I love you rain or shine. You can stand under my umbrella anytime. I adore this kit as it fits for so many occasions. I made a love card with the stamps, the pretty dies and the stencil. I cannot tell you how excited I am that stencils are now part of MCT. Here is a closer look at my love card using these new goodies. 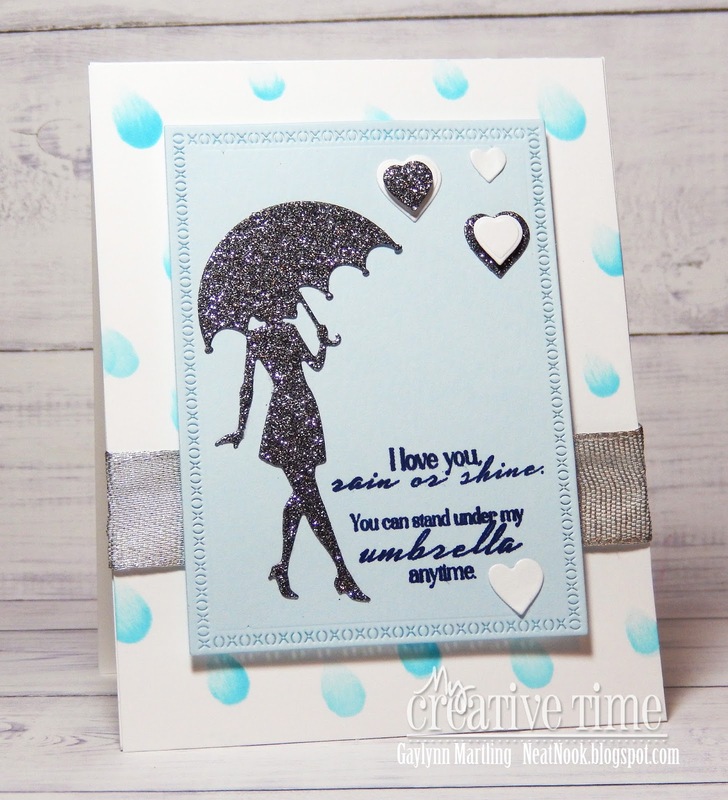 For this card, I first made a raindrop background with the stencil, distress ink and a foam applicator. The drops have an ombre look. Then, I die-cut an image panel for the center. The sentiments were combined an stamped in blue. The die-cut glitter girl and hearts were layered and adhered in place with silver ribbon. I would love to see what you make with these goodies. Share your MCT projects in the My Creative Time Inspired facebook group. After you hop, then shop My Creative Time.